Set of 6 - 3 inch carabiner that protects against corrosion. Stainless steel carabiner adequate weight to support it, super solid,durable. 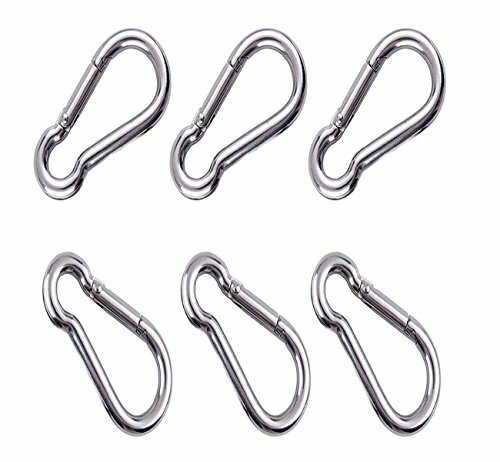 Package contents - 6 pack carabiner hooks, 3-3/16" (8 x 80mm). Easy to use - 6 quick links with spring action gate for making quick connect/dis-connect of ropes, chains, straps. Wide applications - Great for dog leash, camping, fishing, traveling, hiking, connecting items to a belt and any outdoor use. 100% REFUND GUARANTEE - Each order is guaranteed with a full refund. If you have any questions about this product by Hraindrop, contact us by completing and submitting the form below. If you are looking for a specif part number, please include it with your message.